Stenhousemuir boss Brown Ferguson admitted his side contributed to their own downfall with a below-par display at Stranraer on Saturday. Sluggish Stenny went down to a 2-0 defeat in what the Warriors boss conceded was far from a classic. The home side made the crucial breakthrough when Kyle Turner steered his shot past Graeme Smith just before half-time. And the points were sealed for the home side 20 minutes into the second period when their advantage was doubled by on-loan Kilmarnock striker Innes Cameron. The visitors rarely looked like salvaging the match and Ferguson admitted: “The performance was below our expectations. “We need to do the basics well in any game of football and on Saturday we lost the game for that reason. We offered Stranraer more opportunities and had more mistakes in our play than they did. “That was ultimately the deciding factor and we’ve got to learn from that. People would normally talk about us digging in and being hard to break down, hard to beat. “But we were too easy on Saturday to get at by a team who, no disprespect to Stranraer, weren’t playing particularly well either. It was a similar type of display to the one in last month’s loss at Forfar and Ferguson knows an improvement will be required this Saturday when unbeaten League One leaders Arbroath come to Ochilview. 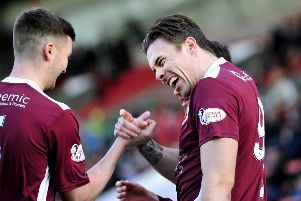 Ferguson said: “Apart from Forfar every other game I’ve been pleased in terms of our performance. But nobody wants to travel that far, particularly supporters, and see that type of performance. “Against Arbroath we’ll be up against a team who are performing well at the top of the table and it’s going to be a challenge. We need to make sure we are back to the level that I am expecting and in fairness so far this season in home games it’s been good. “I fully expect we switch on better to the game on Saturday, albeit it’s still going to be a very difficult game. “But if we do the basic part better we give ourselves a chance. Then hopefully on the day we can perform as well with the ball, because we’re going to need to do that on Saturday. “They’re performing well but that doesn’t bother me. In supposedly tougher challenges we’ve had this season the players have risen to the game. We’ve not always won but we’ve performed and that’s the thing first and foremost that I want to see.